The kids had a day off from school last Monday, and with a rare sunbreak from the rain, I decided to take them to the zoo. 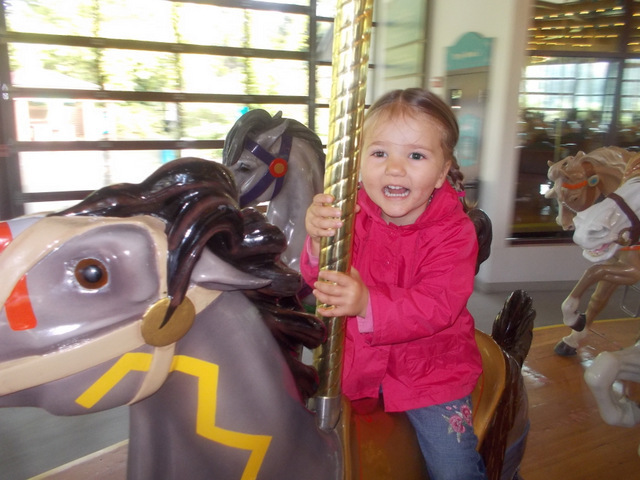 Katie, funnily enough, has been asking to go to the zoo and ride the merry-go-round for weeks. This is unusual because I don’t think she’s been to the zoo for 4-5 months. It’s not often she remembers and talks about something that happened so long ago. Then I let each of the other children choose one favorite thing to see. Eleanor is reading The Reptile Room in the Series of Unfortunate Events, so she chose the small animal house. Featured in this picture are a group of Egyptian tortoises, the cutest reptiles ever. Jeff wanted to see the Asian small-clawed otters, mainly because there’s a playground nearby with a zipline. But know what? Asian small-clawed otters are difficult to photograph. Instead, I will present you with a very cute photo of all four kids sitting on the statue of the komodo dragon. Lastly, William wanted to see the giraffes. D’awww, his smile is adorable! Giraffes are always in enclosures that look like they did something really bad out in the wild and now they are in prison or something – all concrete and tall fences. I can totally see the Mafia Giraffia coming down hard on some little antelope shops… see here, you don’t want anything bad to happen to your Savannah, right?